Having recently upgraded from a two-person, three season tent to a three-person, four season tent and anxious to give that new tent of ours a try in the great outdoors, we car camped along the beautiful Gorge Lake at the Gorge Lake Campgrounds. Not far from Rainy Pass, the Gorge Lake Campgrounds is our favorite over the more popular (and crowded and noisy) Colonial Creek Campground. Gorge Lake Campgrounds sits enough off of Highway 20 and, protected by Gorge Lake, doesn’t suffer from all the traffic noise that often interrupts the beauty of the Colonial Creek Campground, and since it’s such a small campgrounds, it has a more wilderness-like feeling to it. We left home early in the morning on our two-hour drive to the campgrounds, and it was all but empty when we arrived. Once our camp was set up, we headed to the Blue Lake trailhead to hike. 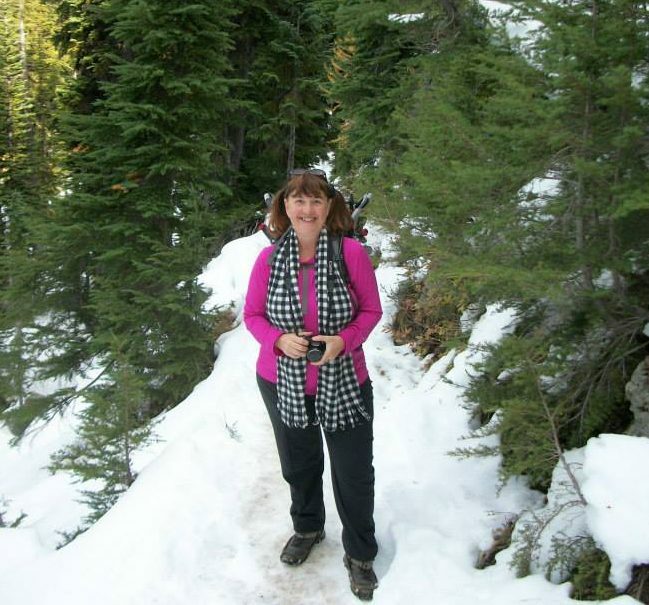 There was a little snow on the boardwalk leading into the forest, but we were expecting snow and were well prepared with both our snowshoes and ice trekkers. 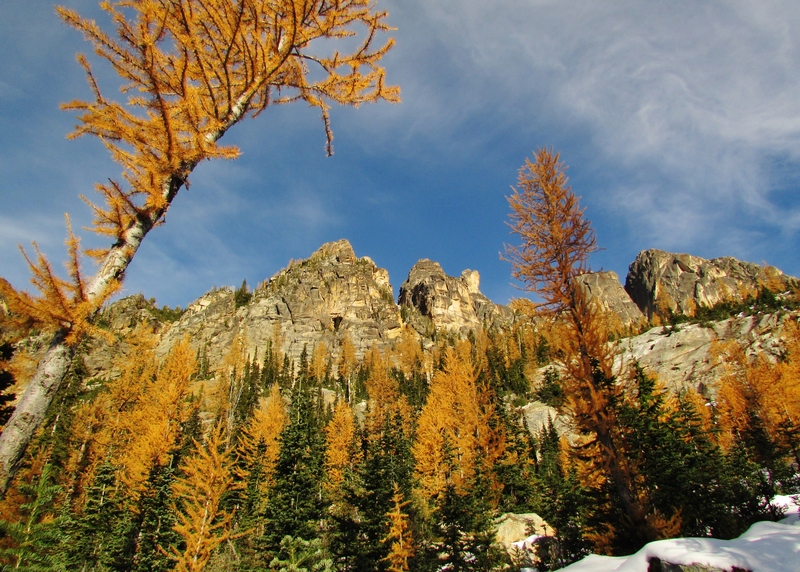 We were in search of the golden larches, and it felt like we hit the jackpot! The trail was an easy thousand foot elevation gain over its just over two miles to the lake, and as we got higher, more snow covered our path. The snow was crusty so our ice trekkers made for great traction. Sunshine, golden larches, snow, a beautiful day and the best hiking partner, who would ask for anything more? Blue Lake was pretty much frozen solid, and in a position that was mostly shaded, so the larches weren’t showing as brilliantly gold as the ones along the trail to the lake, but it certainly was a lovely, alpine lake. We sat above the lake and enjoyed a picnic lunch before heading back down to the trailhead. This was the second Blue Lake we’ve hiked to recently. The other Blue Lake is on the way to Dock Butte (go here #161 – Dock Butte & Blue Lake – to read about that hike), and this one is by Rainy Pass. Go here – http://www.wta.org/go-hiking/hikes/blue-lake – for information about the Blue Lake, Rainy Pass hike, and here – http://www.nps.gov/noca/planyourvisit/camping.htm#CP_JUMP_628809 – for information about the Gorge Lake Campgrounds. There are even more Blue Lakes in Washington, it would be fun to hike to all of them.